Operating Seasons and Hours: 8:00 am - dusk from April to October. 9:00 am to dusk from October to April. This was the second stop on the Southern Utah Road Trip that my husband and I went on in May of 2010. We left the Territorial State House in Fillmore, Utah and drove 32 miles down to where I-70 meets I-15. This is the location of Cove Fort. Lately I've realized something about myself. I have no patience for history museums. I just don't see the appeal of viewing a bunch of artifacts through glass. I don't feel any connection to a display of items from a long ago. It all feels very sterile and lifeless. However, I love to visit historical sites. I like to see where things actually happened. Seeing objects in the rooms where they were used makes everything come alive for me. I can imagine what it would have been like to live there. Cove Fort is one of those places that I enjoy visiting and learning about the history of the area. I first visited it as a teenager. 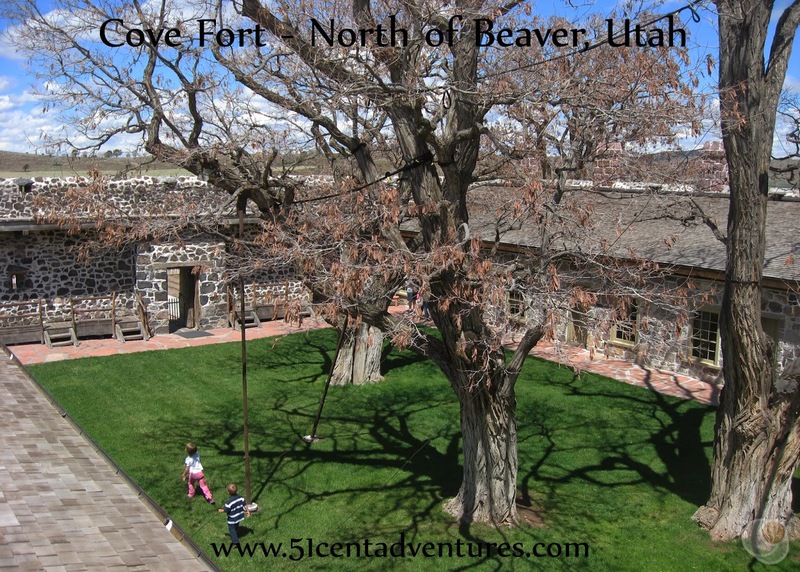 I liked that visit enough that I put Cove Fort onto the itinerary for our Southern Utah Road Trip. Pioneers from the Church of Jesus Christ of Latter Day Saints (often called the Mormon Pioneers) came to Utah in 1847. They arrived in the Salt Lake Valley, and soon began spreading out and settling throughout the West. What has been nicknamed "The Mormon Corridor" stretches from Idaho to California. Settlements were established roughly one day's journey away from each other. The idea was that travelers could always have somewhere safe to stay the night. In 1867 Cove Fort was erected to provide a stopping place between Kanosh to the north and Beaver to the south. The fort was constructed during the Black Hawk War which lasted from 1865 to 1872. Tensions between the white settlers and the Ute, Paiute, Apache, and Navajo Tribes were high. There were several battles throughout the territory. As a defensive measure, the fort was built with very thick walls of volcanic rock. 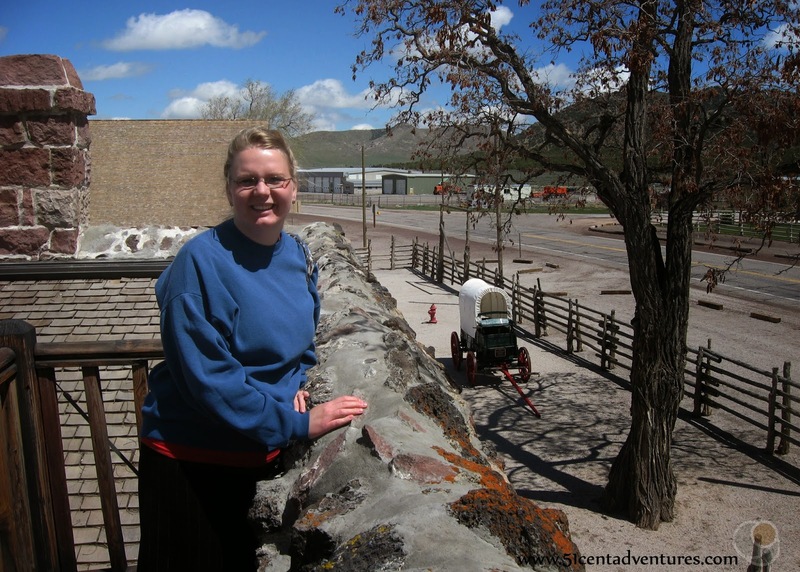 Those thick walls are one of the reasons that Cove Fort it the only Mormon Pioneer Era fort that is still standing today. The fort wasn't used just for defense. It also housed the telegraph and the telegraph opperator. US mail carriers and other travelers would stop at the fort. The family members of those who were assigned to maintain the fort also lived there. The fort today is set up the way it was back in the 1860's. Most of the furniture isn't original to the fort, but it is all authentic to the period. The fort is maintained by the LDS church. The tour guides are all older, married couples who are called to serve as missionaries at the fort. They will work a little bit of LDS teachings into the tour, but they will also give you a lot of historical information. I didn't take many pictures of Cove Fort when Brandon and I stopped there on our vacation. In my mind it was just another of the many LDS themed museums that I had visited over the years and therefore it wasn't very special. Looking back though, I wish I had taken more pictures. There were things on display there that I haven't seen anywhere else. The main thing that I wish I had a picture of was the telegraph machine. The electricity for the telegraph was generated using different chemicals. The bottles containing the chemicals are all on display along with the telegraph. It was pretty interesting. There are rooms built into all four walls of Cove Fort. The tour takes you to through most of the rooms. At the end you can even stand on top of the walls of the Fort. I liked standing up there and imagining what everything looked like over a hundred years ago. Brandon and I didn't stay at Cove Fort very long. The tour took about 30 minutes. We ate a few snacks at the picnic area near the fort, and then continued south. Recommendation: Cove Fort is a great place to gain an appreciation for pioneer era history. It's close enough to two interstates that it makes a good place to stop for a break. Directions: Cove Fort is located just a little to the north of where I-15 and I-70 meet. There are signs that will direct you to the fort. There isn't a town within 20 miles of the fort, but there is a gas station about a mile to the north. Keep in mind that gas prices at that station will probably be about 15 to 20 cents more expensive than they would be in a town so plan accordingly. Additional Information: Cove Fort was never involved in any battles during the Black Hawk War. In fact, the only person shot there was one of the sons of the family who maintained the fort. He was shot in the leg by accident. For more information about Utah's Black Hawk War visit http://historytogo.utah.gov/utah_chapters/american_indians/blackhawkwar.html. Places nearby: Fremont Indian State Park is only 20 minutes to the east. It's located along I-70 in Clear Creek Canyon. We didn't have time to stop there, but it is somewhere I'd like to visit in the future.